Silver Plate can be divided neatly into two categories: Sheffield plate and Electro-plate. However, a distinction has to be drawn between Sheffield plate and Old Sheffield plate. Old Sheffield plate is produced by placing a sheet of copper sandwiched between two thin sheets of silver and then fusing them together by heat. The process was invented by Thomas Boulsover in 1742 and lasted for approximately one hundred years when the process lapsed on the introduction of silver plating by electro-deposition. This technique is often referred to as Sheffield plate. 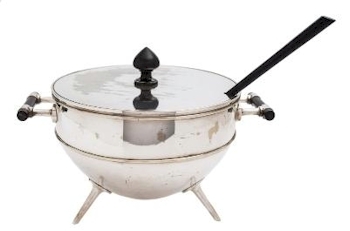 A silver plate tureen (FS39/5) with cover and ladle, by Christopher Dresser (1834-1904) realised £4,000. Some of the notable Old Sheffield plate makers included Thomas Boulsover, J Dixon & Sons, Boulton & Fothergill and W Hutton. The ability to produce cheaper items using this plated method not only appealed to the silversmiths who found wider markets, but also to the growing affluent middle class who may not have been able to afford items in solid silver, but could certainly afford items that were plated. As demand for plated items increased, an even quicker and cheaper form of silver plating was discovered. This was silver plating by electro-deposition or electro-plating. Often pieces plated like this are stamped Sheffield Plate. Simply put, an object made of copper is submerged in a silver nitrate solution through which an electrical current is passed causing the silver in the silver nitrate to be deposited on the copper object, thus plating the surface in a thin coat of silver. First appearing in the 1850s, this ability to make objects look as if they were solid silver at a relatively cheap price soon took off. 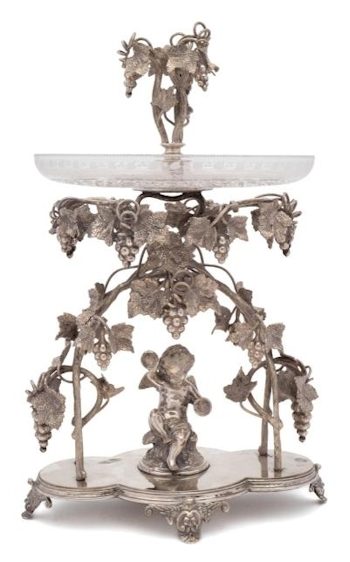 A Victorian silver plated table centrepiece (FS40/1) by L&WS sold for £240. One of the greatest exponents of this new electro-plating was the firm of Elkington, Mason & Co, founded in the 1830s. Elkington & Co as it eventually became were one of the prime producers of silver-plating. They received various Royal Warrants and Appointments. They produced high quality pieces to exhibition standards and their silver plated wares are much sort after. As we entered the 20th century, items that were silver plated carried assorted marks. Some were marked EPNS (Electro-plate nickel silver), some are marked 'A1' or 'A1 plate' and others are marked Sheffield Plate. So it must be borne in mind that Sheffield plate and Old Sheffield plate are not the same and are two quite different manufacturing processes. Continental silver plate manufacturers include Christofle Plate in France and Wurtemmbergische Metallwarenfabrik (WMF) in Germany.